20/04/2012 LINK: Blogpost on Martin Stephenson. And its a cracker! Let's Off-Road - Part 4. Seeing my favourite footballer scoring a goal. 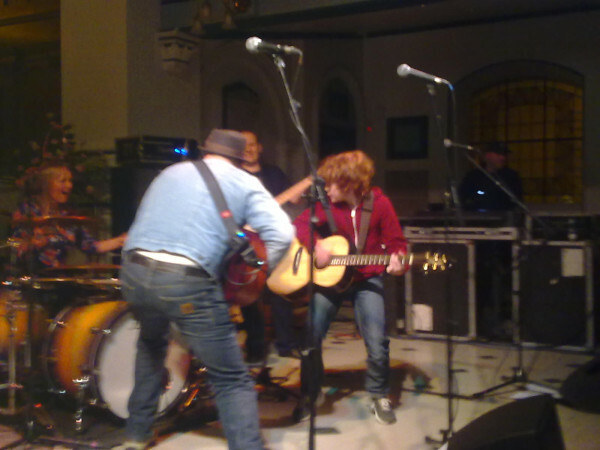 Catching my favourite band playing in a church. Meeting up with friends new and old. The Daintees arrived in Brighton after a reportedly very well attended London gig the night before. The "buzz" around this tour has been something very special and surely must have exceeded everyones expectations. It does leave one wondering "what next?" More of the same with this band gelling so well must happen at some point, but would we be hugely surprised if Martin threw in a career spannering alt.country/death metal crossover album? Errr no. In St Georges church, Helen kicked off with her regular set, and it was apparent that Helen's voice has changed during the week. She was reaching the higher notes with complete ease and no sign of strain whatsoever. Afterwards, admitting that she was really tired, made me wonder if the body reacts in some way in such situations so as to concentrate itself on the bits it really needs to i.e. for a singer, her "voice". I wonder if this is usual in some kind of "road hardening" way. In short, her set was effortless and went down a storm. Helen's daughter in the audience, I'm sure, must have been very proud. And then, Martin Stephenson And The Daintees. In summary, for me, the best performance of the three I have seen this week. Boat To Bolivia was played in its entirety, and played pretty straight in the main. The remainder of the set list was very similar to the earlier gigs plus we got to hear Left Us To Burn and Neon Skies. The latter, an absolute stormer. Oh and a cheeky little run through of the Maverick Waltz that seemed to take everyone except Martin by surprise. Martin's banter was very sharp, very focussed, and frequently very moving. The sound was also the best of the gigs this week. Which, I guess, shouldn't be a surprise on the one hand given the natural acoustic properties of churches, but at the same time they are not used to rock bands making the sounds, so much kudos to the sound engineer. It did enable the audience to hear John Steel's guitar more clearly than the earlier gigs, and it was a delight to hear the subtleties of this great musician's playing. And Lou Short on bass. What a star. He absolutely nailed the job and his smile was Dainteely infectious. But when I say the word star, clearly I am misleading you, dear blog reader. That accolade goes without doubt to The Daintees new 10 year old rhythm guitarist Alex. He was handed a guitar by Martin for Wholly Humble Heart and boy did he have the looks, the action, the whole geetar thing going on. Alex was to return to the stage again, triumphantly, to take part in the closing song Salutation Road, complete with longest, most elaborate audience walkabout of the tour. Just look at drummer Kate's face on that photo. Sums up the whole week for me. In conclusion. Daintees. "We want more". Earlier in the day we had seen Hull City draw 1-1 at Watford. A frustrating performance, but we did see the mighty fine James Chester score a goal. From a corner. This, I have to tell you, is as rare as a Chefs single. So TTID completes its tour of the b-roads and c-roads of music, with a very subtle and, I'm sure you will agree, totally unforced comparison with the finest football team the world has ever seen. We are officially knackered and if anyone is expecting a detailed review of the music listed a couple of weeks back - tough! Back in a week. Oh sorry, final score? City stay in the Championship; Daintees go through to meet Barcelona in the Champions League final. Iniesta or Steel - whaddya reckon?